The very eccentric Groomkirby family, in between inventing odd devices, decide to reenact a murder and trial in their living room. A group of (literally) drifting popsters find themselves involved in a grim sand-and-sandals desert movie. They reckon a few song-and-dance numbers would liven things up. In 1950s America, an FBI agent and a blacklist victim uncover a plot to smuggle Nazi war criminals into the country. The working-class Smiths change their initially sunny views on World War I after the three boys of the family witness the harsh reality of trench warfare. Don: [very fast] You know I wouldn't be surprised / That gasket hood looks pulverized / The shock recoil is now reversed / At first you'd boil and then you'd burst / Compression seep will soon distend / The leak that leaks in your big end / The lousy coke has got a hitch around the choke adjustment switch / Your piston spout is dynamite / In cutting out the parking light / And, from its shake, your outside brake is needing a new drum! Don, Cyril, Steve, Edwin: [slower] In fact make no mistake, you've really had it chum! 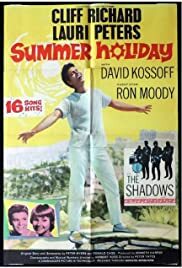 The film-musical of Cliff Richard and The Shadows is a selection of brassy dance sets and a couple of The Shadows songs with a basic story where bus mechanics take a bus to France, pick up some girls going to Athens, and an American "boy" stows away to ensure a US cinema release. Along the way they stop in a very Greek looking Yugoslavia and meet some Kossacks (in Yugoslavia ?) who must have come across the Black Sea and got lost or kidnapped by Tito. Product placements - BEA airlines, Intervilla Holidays and BP Zoom Scooter 2 stroke fuel mix.